First, I’m not sure that you two are the right folks to ask, but I know that you’ll know where this should go. 1) Given the known, or assumed, status of the three units and four pools, what realistic scenarios exist for energetic dispersion of high quantities of radioactive material that would result in mobile plumes? 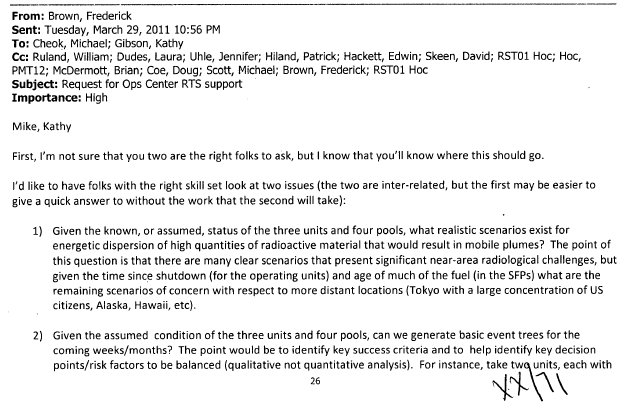 The point of this question is that there are many clear scenarios that present significant near-area radiological challenges, but given the time since shutdown (for the operating units) and age of much of the fuel (in the SFPs) what are the remaining scenarios of concern with respect to more distant locations (Tokyo with a large concentration of US citizens, Alaska, Hawaii, etc). 2) Given the assumed condition of the three units and four pools, can we generate basic event trees for the coming weeks/months? The point would be to identify key success criteria and to help identify key decision points/risk factors to be balanced (qualitative not quantitative analysis). For instance, take tw units, each with significant core damage and prior release of volatile fission products, each with primary and secondary containment failure, but one with an intact RPV and the other with a breach of RPV -would there be a difference in potential releases that would lead to different strategies for flooding the primary containment of these two units? This question will make more sense if you look at the assumed conditions below and the attached assessment document where we recommend that TEPCO utilize the SAMG recommendation to flood all 3 units’ containments. Note that the intent is to limit this activity to hours and days, not weeks ory•ears. Once we validate the concept of this evaluation, we can turn it over to US industry for further action/development. Unit 1 Rx: Shutdown 3/11. 70% core damage. Cooling with 30 gpm. Significant salt deposits in vessel, core spay plugged. Primary pressure 65 psig. Drywell pressure 25 psig. Secondary containment destroyed. Containment has been vented at least once since fuel damage occurred. Attempting to establish Nitrogen purge prior to resuming venting. Unit 2 Rx: Shutdown 3/11. 30% core damage. Significant salt deposits in vessel/drywell. Assumed RPV breach, with at least some core ex-vessel that ocurred approximately 3/15. Primary containment breached in the torus. Secondary containment breached. Significant release of volatile fission products has occurred through both airborne release and also via water drainage out of the Rx building. Unit 3 Rx: same assumptions as Unit 2, but do not assume RPV failure and location of primary containment breach may be the drywell. SFP 1: 292 bundles. Pool intact. All fuel at least 12 years old. No secondary containment. Rubble on top of pool. Water can be added through external spray. Now at saturation temperature. SFP 2: 587 bundles. Pool intact. Water added to the point of pool over-flow. Pool had reached saturation temperature at one time. SFP 3: 548 bundles. Y4 core offload previous refueling. No checker boarding of hotter fuel. Structural damage to pool area suspected. Pool leakage possible. External addition of water has been made repeatedly, but flooding of pool may not be possible due to damage. SFP 4: 1331 bundles. Full core offload about 120 days ago. No checker boarding of hotter fuel. Structural damage to pool area is known to exist, and structure may not support a full pool weight load. Pool leakage likely, requiring addition of water periodically. 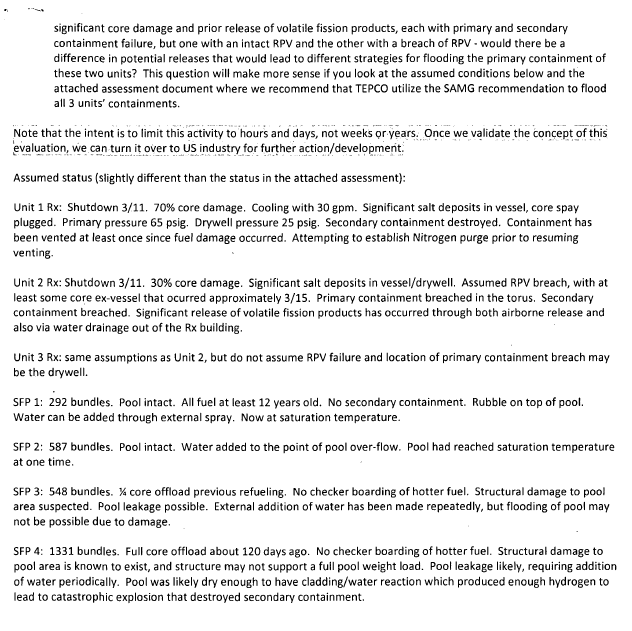 Pool was likely dry enough to have cladding/water reaction which produced enough hydrogen to lead to catastrophic explosion that destroyed secondary containment.